UNU-FLORES offers a rigorous internship programme giving students and recent graduates the opportunity to develop new skills and knowledge in a constructive setting for the practical application of their capacities acquired during their studies. Through hands-on experience, interns work in a variety of areas from academic research, event organisation, communications and advocacy, and institutional development and administration. In this series, we feature the young brilliant minds that have played a big part in many of our activities and events. 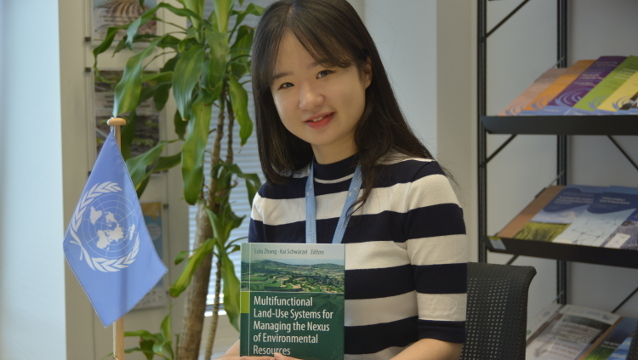 In this interview, we talked to Hakyung Lee from Korea, who worked with the Soil and Land-Use Management unit. Tell us about yourself. What is your motivation to do an internship with UNU-FLORES? Coming from an environmental engineering background, I am interested in environmental issues from the perspective of the engineer. When I first started studying, I only focused on local issues but increasingly I found that a global perspective could impact a greater change. Besides, environmental problems are often related to each other. The concept of Nexus Approach acknowledges that. I recognised the importance of the nexus of water, soil, and waste. I had taken classes on water treatment, soil contamination management, and resources recycling in waste management at university. I desired to learn more about them on the field with experts. UNU-FLORES emphasises on education and gives opportunities for future environmental leaders. I find education the best and fastest way for young people, who may be indifferent to environmental issues, to recognise its importance. Also, I was very impressed with the affairs of international organisations through some projects I was part of in Korea. So, I aimed to work in an international organisation and applied to the UNU-FLORES internship programme, which covers everything that I wished to do. What types of projects do you work on? What’s your favourite part of work/highlight of your internship? In the publication project about afforestation in drylands, with a focus on global afforestation actions and policies, my main task was to do a literature review with different keywords. Also, I started to write an article about afforestation using case studies in different countries. As it was the first time for me to write an academic paper, I learned about the process and enhanced my research skills. It was my favourite part of work because participating in actual research is often a rare opportunity in an internship. What kind of skills do you need to be successful at your internship? The ability to identify proper keywords for the topic is important in a research internship. I do literature review on various websites and search for data for the case of different countries. There are many synonyms for one concept. As a research intern in UNU-FLORES, I recommend also not concentrating only on the work of one’s unit, but to be interested in other units’ work, too. There are regular seminars and lectures on various topics. There, I learned new and useful things. Directly seeing how other units try to realise the Nexus Approach enabled me to understand the concept better. What are some words of wisdom you’d give to anyone aspiring to be in your position? Go beyond the ‘nexus’ in environmental resource management, and engage also in the ‘social nexus’! One of the most precious things about this internship is that I got to meet people from different countries. I enjoy lunchtime, sharing and exchanging stories and learning about each other’s cultures. It is clear that we influence each other. If one gets the opportunity to do an internship at UNU-FLORES, I hope he or she values these relationships.